New Dates for Applique Retreat! As promised in my last post, here are the dates for the upcoming Applique Retreat. The Retreat will be held Monday October 22 through to Wednesday October 24. The project I have picked for this Retreat is “Crazy for Callas”, a class I taught at the Academy in 2017. I teach the Prepared Edge method and I am so excited about this method that I want to share it with the world! So easy and stress-free. This wall hanging has a few tricks that I would love to share, like how to get those super sharp points! 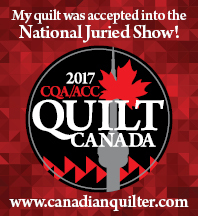 The Retreat will be held at Fireside Retreat in Orillia, an awesome facility dedicated to quilting retreats of all kinds. The cost for the Retreat is $400.00, which includes your accommodation and your meals starting with lunch on Monday and ending with brunch on Wednesday. The cost also includes your kit for the project, Crazy for Callas. If you are interested in coming, please contact me at burke.kerry@ymail.com. Space is limited to 7 students, so please don’t wait too long to decide! « Block 8 and other fun stuff! Hi Kerry, wish you would come and teach in East TN one day. I love your teaching method. Have fun in October.